I thought it was time to update and provide some new information about my forbears. I have a number of articles coming up taken from W.D.F. 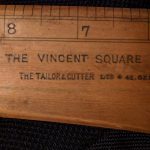 Vincents book “The Tailors Handbook of Useful Information on Social, Literary, Historical, Practical and Scientific Subjects”, but first I thought I’d resurrect an earlier article about the Vincent Square now that I have acquired my own square. My thanks again to the Slide Rule Circle for the article. and there are some new pages and posts coming in the next few weeks.